Craps Strategy Games Terms, part 3 completes craps gamerisms. Craps terms, lingo and jargon reported here that qualify for the unusual include Midnight, Outstanding in Your Field, Rhythmic Rollers, Square Pair and Up Pops the Devil. Marker Puck: disk for marking point of on or off at craps table. Midnight: number 12 or wagering that the next roll will be a 12. Miss: rolling a seven after the point has been established. Alternate terms are seven out or miss out. Natural: tossing a 7 or 11 on the come out roll. Nina from Pasadena: craps lingo for betting that the next roll will total 9. Numbers: refers to numbers, 4, 5, 6, 8, 9, and 10. Odds Bets: after the come out roll, an additional bet on, come, don't come, place, and don't place bets. At 2x odds, you bet $20 to win $40. Odds Off: come odds bets are ‘off’ during the come out roll, unless requested to be ‘working’. Players can request odds off for the next roll of the dice. One Roll Bets: betting on the next roll only. Examples are any craps, horn and field wagers. Outside Numbers: craps jargon for place numbers: 4, 5, 9, and 10. Outstanding in your Field: wagering that the next roll will total 12. Pair of Aces in the Wrong Places: number 2. Parlay: keep those winnings in play. Pass Line Bet: betting made before the come out roll that a 7 or 11 would be thrown. Pays even money. 2, 3 or 12 on the same roll will lose. Pit: players are not allowed to walk through this area behind the tables. In the pit are floor persons, who are one step above the boxmen. Their primary functions are to watch out for cheaters and to keep track of rated players. When you first check in and ask for a marker, or when you leave and ask for a comp, or if you switch tables, this will all be handled by a floor person. Supervising all of this is the pit boss. He is in charge of the casino personnel at all of the tables. You will rarely see him.If you have a dispute regarding ratings or table play you will be speaking with a floor person, not the pit boss. Place Bet: betting on numbers 4, 5, 6, 8, 9, or 10 or combinations that your pick will repeat before a 7 is rolled. Place Numbers: 4, 5, 6, 8, 9, or 10. If rolled on the come out, that number then becomes the point number. Playing the Field: craps bet placed at the ‘field box’ that the next number rolled will be a 2, 3, 4, 9, 10, 11 or 12. Point Number: determined on the come out roll, the point number will be one of these numbers--4, 5, 6, 8, 9 or 10. Once established, the craps shooter tries to again throw the point number before a 7 to win. Press a Bet: craps lingo for double your bet. Proposition Bet: wagers made in the center of the craps table. Puck or Disk: is white on one side and black on the opposite side. Showing white indicates a come out roll has taken place and point is established. Conversely, if you notice the puck with the black side off in the don’t come area, the next roll is a come out. Put Bet: player selects a point number with a put bet after the come out roll. The downside is that sevens and elevens mean a losing bet. Quarters: craps jargon for $25 chips. Rails: area surrounding the craps table where players hold their chips. Rhythmic Rollers: players who have learned to ‘grip’ the dice to determine the outcome of a roll. This is a craps strategy that is growing in popularity. Right Bettor: craps player who bets pass and come to win. Roll: is either a single roll of the dice or a set of dice rolls until the craps shooter sevens out. Rounding: term for payout amount rounded up or down. Seven Out: rolling a seven after the point has been established. Also, miss or miss out. Shoot: series of dice rolls until the craps shooter sevens out. Shooter: craps player who rolls the dice. Single Odds: betting odds for the same amount of money as the original pass or come bet. Six-Ace: craps lingo for bet that the next roll will be a 7. Six Five, No Jive: wagering that the next roll will total 11. Snake Eyes: the number 2 or wagering that the next roll will be a 2. Square Pair: craps jargon for wagering that the next roll will be a hard 8 (4+4). Stickman: the person with a stick and technically one of the three dealers who take turns with the stick. The stickman retrieves the dice and pushes them to the shooter, taking care not to display the dreadful seven that is considered bad luck. Also, takes care of the proposition bets, helps the other two dealers and handles all of the players’ bets. Table: at land-based casinos, there are signs on both sides of the table announcing what the minimum and maximum bets are. For example=$10 to $1,000, 2X odds means that the minimum flat bet is $10, the maximum flat bet is $1,000 and the casino offers two times odds. There are usually several tables in the pit area, with different stated limits. It is not uncommon to see four tables, each with different minimums. Usually on weekdays, the minimums are lower, and on weekend evenings, the minimums are as high as the traffic will allow. In the evenings, when all the tables are in use, the house usually raises all of the minimum bets. If you are a low dollar player, your best time is the daytime. Those minimum and maximum bets apply to flat bets only, not proposition bets. If you want to bet higher than usual on the 2, 3, 11, 12 or hardways you better ask the dealer what the upper limits are as they are never posted. On the table, there are grooved chip holders in the sides to hold your chips. Use one of these racks to track the table. Just use a red chip for pass-line winners and a white one for don’t pass winners. This way you can see which way the table is going. For example if you have four red chips and only one white, you’ve got a hot table, and you might want to increase your bets and odds. If you have more white chips than red ones, you might want to switch to the don’t side. The dealer will never make hand-to-hand contact with you, your money or your chips. If you want your cash turned into chips, drop it on the table and say change. He will take your money, convert and push the chips back to you. Even when you win a bet, he will either place your winnings next to your bet, or push them toward you. Never try to hand anything directly to a dealer. Take the Odds: added bet on come, don’t come, place and don’t place after come out roll. Taken Down: bet returned to player, as per their request to have it removed. 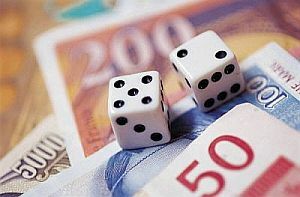 Three-way Craps: bet of 3 units where 1 unit=number 2, 1 unit=number 3 and 1 unit=number 12. Toke: tip for casino craps employees. Two Aces: craps lingo for number 2. Two Ways: player uses this term when betting for the dealer and for his/her own bet. Usually a hardways or proposition bet where a $10 two ways bet divides as $5 for the dealer and $5 for the player. Up Pops the Devil: wagering that the next roll will be a 7. Vigorish: also known as vig, this is the casino commission. Whirl Bet: betting that the next toss is 2, 3, 7, 11 or 12. Wagers are in multiples of 5 and each unit=one number. For $5 bet=$1 on numbers 2, 3, 7 and $2 on 11 or 12. Also known as a world bet. Winner on the Dark Side: craps lingo for wagering that the next roll will be a 3. Working: refers to some bets that will be at risk on the next roll. Wrong Bettor: craps player who bets don’t pass and don’t come to win. Yo: craps lingo for the number 11. Yo eleven: wagering that the next roll will total 11. If you lay the four for $40 and win, what is the payout? B. You win $20 less $1 vig, plus you get your $40 back, for a total of $59. Craps Strategy Games Terms ends the glossary. What is the total number of combinations that a pair of dice can be rolled?